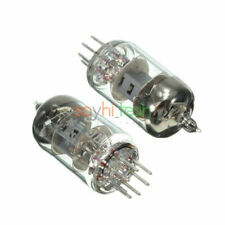 ● Dual triode vacuum tube 6n8s (analogue 6SN7) (not hybrid). This is a used item, in excellent working condition. "Nick" Headphone Tube Amplifier. 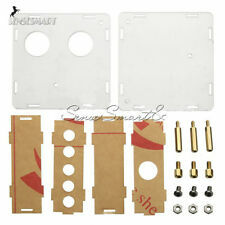 ● Output - 1/4” (6,3 mm) jack (headphone impedance: 25 ohm - 600 ohm). This is for a used Little Dot MKIII headphone amplifier and preamp. The list of tubes included is below. It is EF92 because of the CV4015s. And I set the gain to low AKA high sensitivity which is default. Schiit Lyr 2 Headphone Amp/Preamp with tubes. Very lush/warm-sounding compared to some of Schiit's other offerings, which in my opinion can sometimes have a bit of hardness to them. This paired very well with my previous speakers that had somewhat harsh upper mids. Took the edge off nicely. Beware that the impedance matching can be a little trickier on this unit. I ran into an issue where putting a passive preamp before the Lyr 2 didn't work out so well, whereas coming straight from the Bifrost DAC sounded great. Tubes are the stock Canadians. No manual or box, sorry. Just the power cord and tubes included with the unit. Will come very carefully packed. Darkvoice 3322 tube headphone amplifier. Condition is Used. With some cleaning and new tubes (which can be sourced for under 50$) this amplifier will be up and running in no time. Shipped with USPS Priority Mail. I am an electronics engineer with 35 years of experience and an audio nut. The tube drives into a mosfet that goes into a current sink. The tube plus Class-A low impedance output will drive any headphones easily. SCHIIT VALHALLA 2 TUBE HEADPHONE AMP • MINT/FLAWLESS CONDITION! Condition is Used. C o m e s w i t h s t o c k S c h i i t t u b e s i n o r i g i n a l b o x, b u t a m p i s E Z t o t u b e r o l l f o r a n y 6 D J 8 / 6 9 2 2 / E C C 8 8 / E C C 8 5 / 6 B Z 7 / e t c.
It is in excellent condition with no marks or scratches. T1se has a LINE IN port, so it can be a stand-alone amplifier when connecting to an exterior source. Not a bad little Tube DAC- With its long list of features it's a great "bang to buck" winner. Condition is New. I'm willing to let it go for as much as I got it. Bottlehead Mainline. Condition is Used. Constructed using Cardas silver solder. DarkVoice 336SE Headphone Tube Amplifier OTL Headphone Amp w/ INCREDIBLE TUBES! Bought and received from Massdrop in October. If you're here, you know what you're looking at. I'm basically throwing in this (AMAZING) amp for free. Downsizing my audio gear to help build up a down for a house. Trending at $46.99eBay determines this price through a machine learned model of the product's sale prices within the last 90 days. (1) high-end set of two matched-pairs of SOPHIA tubes (i.e., 2x 6SL7, 2x 6SN7). The QUAD PA-ONE has a superb built-in digital to analog converter (DAC) and is ready to go and will accept both analog and digital inputs. Up for sale is a EDOOO TA-01 vacuum tube headphone amplifier in excellent condition. Sound is so crisp and loud from this unit. It's like actually being in the recording studio. Includes USB cable and headphone adapter (pictured). 1 Year Little Dot Warranty. Input Impedance: 50K ohms. 110-120V or 220-240V depending on your country. Weight: 3 Kg or 6.6 lbs. High quality aluminum chassis. Power Tubes: 2x Soviet 6H6N (included). Driver Tubes: 2x RTC5654. Massdrop x Alex Cavalli Tube Hybrid Headphone Amp (CTH). Condition is Used. Shipped with USPS First Class Package. Tube: 5z4p 1 6H8C 2 6p1 4. Headphone Amplifier. Integrated Amplifier. Hi-Fi Tube Amplifier. AV Tube Integrated Amplifier. Digital Amplifier. Aluminum Chassis/DIY Enclosure. Tube Headphone Amplifier. Total 7 pairs tubes(5 pairs upgrade tubes). To make things clear, if you'd like to play tube rolling, the tube number for Wa7: 6C45 = 6C45Pi = 6922; for Wa7tp: 12AU7 = 5814a = CV4003 = ECC82. If you just like the best performance, I prefer 6C45Pie/6922 Electro Harmonix Gold-pin for wa7, and CBS-Hytron 5814a for wa7tp. Barely used. Without blemish or defect. In original box!! Ordered new from Linear Tube Audio on Aug 11, 2018. Original tubes have less than 100 hours I'd say. I am the original owner and no longer have a use for this. Other than that, they are super clean and work perfectly. Up for sale is my beloved ALO Studio Six Headphone Amplifier. I bought this unit in 2014. I have switched to speaker system about three years ago and I have not used it for about three years. It is in excellent condition. Part Numbers: 1023A. We do our best to properly describe an item's condition.We make no claims of warranty attached with the item. DO NOT DUPLICATE OR COPY! Includes: Power cord. Headphone Amplifier. Hi-Fi Tube Amplifier. Integrated Amplifier. Digital Amplifier. AV Tube Integrated Amplifier. Aluminum Chassis/DIY Enclosure. B4-X is a dual-mono balanced version. So the degree of sound separation is higher than B4. Trending at $97.49eBay determines this price through a machine learned model of the product's sale prices within the last 90 days. Amplifier, two working vacuum tubes and power adapter included. Douk Audio Little Bear P2 Mini 6C11 Vacuum Tube Headphone Amplifier Stereo Black. Douk Audio Little Bear P2 Mini 6C11 Vacuum Tube OP-amp Hybrid Headphone Amplifier. This is a super mini vacuum tube hybrid headphone amplifier designed by Douk Audio and Little Bear. The HIFIMAN EF100 is a powerful hybrid headphone amplifier and integrated amplifier. Benefiting from vacuum tube technology, both headphone amplifier and power amplifier sound warm, smooth, detailed and musical. 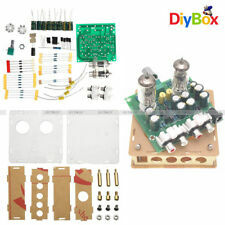 A unique kit for 'Tube Rolling' with your Schiit Lyr or Schiit Lyr 2 headphone amplifier. Kit includes matched pairs of the following tubes Reflektor 6N3P-E (1 pair). Tesla (not JJ) 1960's ECC88 (1 pair). 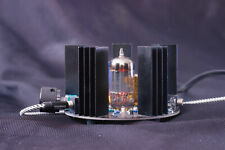 Bravo Audio V2 Upgrade Class A GOLDEN LION ECC82 Tube Multi-Hybrid Amplifier . Condition is Used. Shipped with USPS First Class Package (2 to 3 business days). Comes with GOLDEN LION ECC82 and 3 extra 12AU7 tubes. 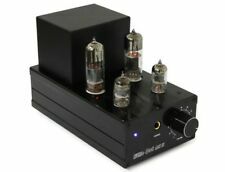 Great hybrid headphone tube amp that can drive any headphone, insane power! The case is in perfect condition, looks brand new. LTA Linear Tube Audio microZOTL balanced Tube Preamp/Headphone Amp $4450 list ! After years of refining and testing the microZOTL circuit, LTA has created the microZOTL Preamplifier. We now use ceramic circuit boards, which result in the clearest, cleanest sounding microZOTL yet. Headphone Amplifier. Hi-Fi Tube Amplifier. Integrated Amplifier. Digital Amplifier. Aluminum Chassis/DIY Enclosure. DIY Chassis / Enclosure. Speaker Protection Board. Nobsound NS-08E 6J9 Vacuum Tube Headphone Amplifier. XiangSheng valve tube Hi-Fi pre amplifier 708 b. Condition is Used. Bravo Audio Ocean Mini Valve Class A Tube Headphone Amplifier Untested ! Hear what you have been missing in your favorite music Bravo Ocean a beautiful looking desktop amp. The Bravo Ocean has 2 x input ports This is a beautiful looking Tube Class A Headphone Amplifier with Aluminum case to help dissipate heat. LUXMAN P-1u Headphone Amplifier. The P-1u is the ultimate model, embodying the essense of direct listening with full use of headphone performance. Continuous power output 2W 2W (8Ω)/1W 1W (16Ω) / 500mW 500mW (32Ω) /. Aune T1 24 Bit USB Tube DAC Headphone Amplifier only! Cypher Labs. Enclosure: Machined aluminum. Headphone power: 0.08 W at 600 ohm, 0.16 W at 300 ohm, 0.36 W at 100 ohm, 1 W at 32 ohm. a pair of tube protection shield. Frequency response: 30 Hz – 30 kHz ( /- 1 dB). Nobsound®——Dou​k Audio. Nobsound®——Douk Audio. Nobsound Bluetooth Tube Integrated Amplifier HiFi Stereo Power Amp USB Headphone. Nobsound MS-10D MKII Hybrid Tube Integrated Amplifier with Bluetooth / USB / Headphone.